In 1861 Northerners played and sang “Dixie” at home, in music halls, and at President Lincoln’s inauguration. By 1863 they didn’t, for the tune symbolized the Confederacy. At the start of the war Northerners sang “Lincoln and Liberty, Too,” and by the end they chanted “Marching Through Georgia.” Southerners didn’t sing “Shiloh Hill” until 1862, because Confederate soldier M.B Smith didn’t write it until after that bloody battle. And almost nobody played “Quince Dillon’s High D” until 1865. Throughout the war Yankees and Rebels both sang “Home, Sweet Home,” sometimes to each other. 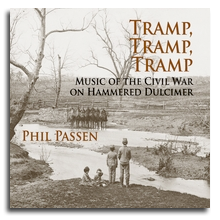 Tramp, Tramp, Tramp presents the music of the Civil War from start to finish. Experience the history of the war through this emotional music.